Nice to Meet You: Over is a multi-site exhibition I curated with Jennifer Lieu, Melinda Guillen, and Zemula Barr. The exhibition ran from April 17-22, 2010 and was staged at both Workspace in Highland Park, CA and RAID Projects in Boyle Heights, CA. Nice to Meet You: Over is a performative exchange between two artists intended to be a reification of the spatial distance between workspace and RAID Projects, marked by the contemplation of voyeurism, the notion of virtual space as a meeting site, and the tensions forged by continuously expanding social networks. Each artist will manifest these themes through their implementation of archaic modes of communication such as fax machines, handwritten letters, and typewriters, as they attempt to get to know one another from a distance. While both participants have strong themes of engagement and mediated communication within their respective oeuvres, their identities will remain undisclosed until the opening, in order to maintain the quality of the mediated, first encounter. Juxtaposing instantaneous and delayed forms of communication, attendees at both spaces will be able to simultaneously witness the encounter in-person, as well as through remote video feeds. Printouts of artists’ communiqués and artifacts from the performance will be on view at both workspace and RAID Projects, through April 22. 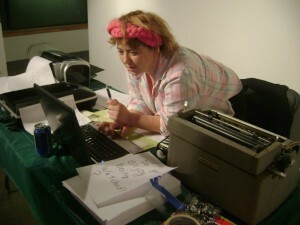 Here I am at RAID, using the installation to interact with gallery-goers at Workspace. 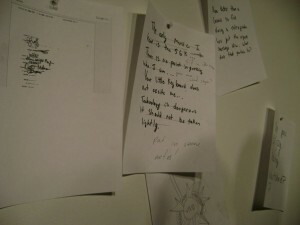 Yelena Zhelezov (featured artist at Raid), drafting correspondence to the artist stationed at Workspace (Kenneth Tam). Installation view of artists’ transmissions.